We are happy to announce that we've completed our months of hard work writing the ultimate how-to book about streaming audio for New Riders publishing! We cover MP3, QuickTime, RealMedia, and Windows Media formats, advanced authoring techniques, legal issues, and much more. 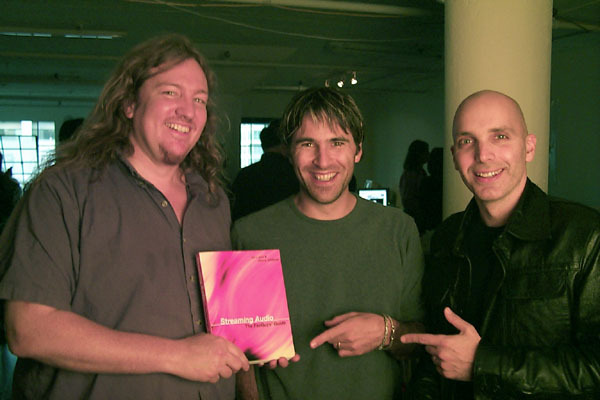 It also features exclusive case studies of SomaFM.com, Satriani.com and KPIG.com. You can order the book online through Amazon which also includes a full table of contents and sample chapter. Like us or the book? Write a review! May '02: DingBat Magazine features the book in their "Summer Reading for Guys 'n Gals 'n Geeks -- 20 Top-Down Tomes"! Wondering just who the heck these FezGuys are? Check out the About The FezGuys page. Since 1996 we've chronicled the rise and rise of Internet audio and its uses. These chronicles were also published in traditional media by EQ Magazine, Gig Magazine, Revolution, and others as well as online (Webmonkey and others). Here are all of the columns and features. We encourage you to peruse them for a how-to guide and a developmental history. -- jump directly to a specific column -- 60 (Oct '01): Updating the Book of Style (CDDB/Gracenote) 59 (Sep '01): Mp3PRO - Taking The World By Donkey 58 (Aug '01): EFF and iTunes 57 (Jul '01): Variable Bitrate MP3 Encoding 56 (Jun '01): Running Around At The Top Of Our Lungs 54/55 (Apr/May '01): Hello Songwriters, Are You Listening? (part 3 of 3) 53 (Mar '01): Hello Songwriters, Are You Listening? (part 2 of 3) 52 (Feb '01): Hello Songwriters, Are You Listening? (part 1 of 3) 51 (Jan '01): From Here On Up It's All Downhill 50 (Dec '00): Too Much Of Everything 49 (Nov '00): Streaming And Scheming... 48 (Oct '00): Hilarity, Hubris and Heuristics 47 (Sep '00): File Sharing Is Fun (Part 2/2) 46 (Aug '00): File Sharing Is Fun (Part 1/2) 45 (Jul '00): MORE PERSONALITY! NEW! BRIGHTER BOX! 44 (Jun '00): Guitars & Geeks, Two Approaches To A New Relationship 43 (May '00): Something Old, Something New, Something Borrowed... 42 (Apr '00): But Who Is Paying Attention? 41 (Mar '00): Lawyers and Players - MP3 in the Spotlight 40 (Feb '00): A Partial Review of Vegas Pro 39 (Jan '00): Post Apocalyptic or Merely Hungover? 38 (Dec '99): Steal This Column! 37 (Nov '99): Frothing At The Mouth On The Frontlines 36 (Oct '99): We've Been Writing This Column For 3 Whole Years! 35 (Sep '99): A Review of Five Sites to Place Your Song 34 (Aug '99): Backspace Project: Creating Equity Over Access 33 (Jul '99): Steve Mack: Project Studio Owner 32 (Jun '99): The RealConference of RealPeople 31 (May '99): Spring Internet World 30 (Apr '99): Water, Water Everywhere... 29 (Mar '99): Why MP3 and For How Long? 28 (Feb '99): Up To Our Ascii In Mail, Version 2 27 (Jan '99): To Rip, Or Not To Rip... 26 (Dec '98): Internet Chivalry Isn't Dead... 25 (Nov '98): A Review of RealAudio's beta G2 Encoder 24 (Oct '98): The End of the Beginning 23 (Sep '98): IFEZ Introduces Streamcore 22 (Aug '98): Why Return To Your Website? 21 (Jul '98): A Review of Audioactive's MP3 Production Studio 20 (Jun '98): Netcasting in Hipboots 19 (May '98): Wrap Your Ears Around QSound's 3D Audio 18 (Apr '98): We Will Serve No Algorithm Before Its Time 17 (Mar '98): Up To Our Ascii In Mail 16 (Feb '98): A Trip To L.A. 15 (Jan '98): Rising Up From The Holiday Bacchanal 14 (Dec '97): Is It Really A Paradigm Shift... 13 (Nov '97): Report On The AES 1997 Conference in NYC 12 (Oct '97): How Many Are You In Internet Years? 11 (Sep '97): Ducats for Downloads? 10 (Aug '97): Get Involved! 09 (Jul '97): Netcasting Live: The Grok Sessions 08 (Jun '97): One Reason To Get Up In The Morning: Money 07 (May '97): Farm Animals And The Law 06 (Apr '97): Geek Thy Neighbor 05 (Mar '97): IWTAATRAAUTIT 04 (Feb '97): Placing Your Song On The Web (part 2) 03 (Jan '97): Placing Your Song On The Web (part 1) 02 (Dec '96): Configure *This* 01 (Nov '96): Introduction -- jump to a specific feature -- Streaming Audio: The FezGuys' Guide (Book) Nov '00: Streaming Audio Tutorial (WebMonkey) Oct '00: Streaming For Dollars (WebMonkey) Aug '00: File-Sharing Primer (WebMonkey) Feb '00: Online Audio: Squashing vs. Streaming (Gigmag) May '99: Evolve or Die: Become a Web-ready Studio Mar '99: Anatomy of a Webcast: The Other Ones Mar '99: Cutting Edge Omnia.net Review May '98: You Don't Need A Record Contract!